The dolphin drive hunts that take place each year in Taiji, Japan, have garnered international attention as the world has learned about the mass slaughter of dolphins and the ruthless captive selection process. These brutal hunts are documented by our team of Cove Monitors each season, and shared with the international public so that attention may be drawn to this outdated and unnecessarily cruel practice. Share your pledge on social media and encourage others to join you! 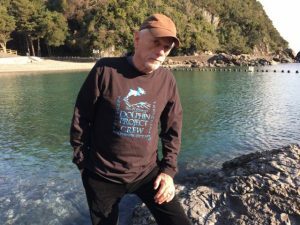 Were you inspired by Ric O’Barry in “The Cove”? Learn more about becoming a volunteer Dolphin Project Cove Monitor. Your support is critical to our mission. If your employer has a matching gifts program, your donation could be doubled or even tripled! Host a movie night at your house and watch “The Cove” or “Blackfish” to educate others about dolphin captivity issues. Have a personal goal you’ve always wanted to accomplish? Want to help protect dolphins? Learn how by creating your very own fundraiser. Think of unique ways to raise awareness in your community. Visit our VOLUNTEER PAGE for ideas. Let your voice be heard for dolphins! Education and spreading the word are key, so follow our social media accounts and share our posts with your friends. 9. WEAR your support for dolphins! SHOP authentic Dolphin Project gear. All proceeds support our international campaigns, and it’s a great way to start a conversation.